Jim Rader remembers the first time Bernie Sanders hit the airwaves as a political candidate. It was 1971 and Sanders, the Liberty Union Party nominee for U.S. Senate, gave a radio interview. Afterward, Rader told Sanders that he'd done well but also asked him about an odd background sound — "a constant rumbling" — that could be heard throughout. "He said, 'I was so nervous, I was pounding the table,'" Rader recalled. In his book, Outsider in the House, Sanders clarified that the sound was his knees knocking against the table. Sanders, who got just 2 percent of the vote in that election, has had a lot of practice since. "I do think he's become much more skilled at expressing his views," said Rader, who has known Sanders since the 1960s and drove him to his first debate, at Lyndon State College, in the same year as the radio debut. "He has come a long, long way." On October 13, the independent senator will test his oratory skills at the highest level against Hillary Clinton — former first lady, senator and secretary of state — in the first Democratic presidential debate of the 2016 campaign. During the Las Vegas event, hosted by CNN, his goal will be nothing less than to convince the American people that he should be the next leader of the free world. Will he be ready? "These debates are very big moments in the campaign," acknowledged Tad Devine, senior adviser to Sanders' campaign. But he predicted Sanders will do just fine. "Sometimes you get a candidate who needs to get up to speed on the issues. He's all set on the substance," Devine said. "I think Bernie is someone who's very conversant with the issues." In fact, Sanders has been eager to debate Clinton, who spent years globetrotting as the U.S. secretary of state; he's been calling on the Democratic National Committee to hold more than the six planned contests. He's also suggested the possibility of debating Republican candidates before the primaries. Just how Sanders will prepare, Devine said, depends on the yet-to-be-announced format. "We don't know what the structure of this thing is going to be or how loose it's going to be," Devine said. Sanders will prep, but he won't go overboard, Devine said. "He's not a guy who wants to take a lot of time away from campaigning to prepare," Devine said. "What you'll see from Bernie in debates is what you see from him on the campaign trail. I don't think there's going to be any dramatic changes. He's very confident that voters seem to like what they're seeing and hearing." The Democratic National Committee has set the rules for who will be included: any Democratic presidential candidate who has received at least 1 percent in three credible national polls. That qualifies Sanders, Clinton, former Maryland governor Martin O'Malley and possibly former Virginia senator Jim Webb and former Rhode Island governor Lincoln Chafee. If Vice President Joe Biden becomes a candidate, he'd surely be onstage, too. Although he hasn't faced a close race since 1994, Sanders has run in 20 elections, during which he's been called everything from a fraud and a liar to a sellout. 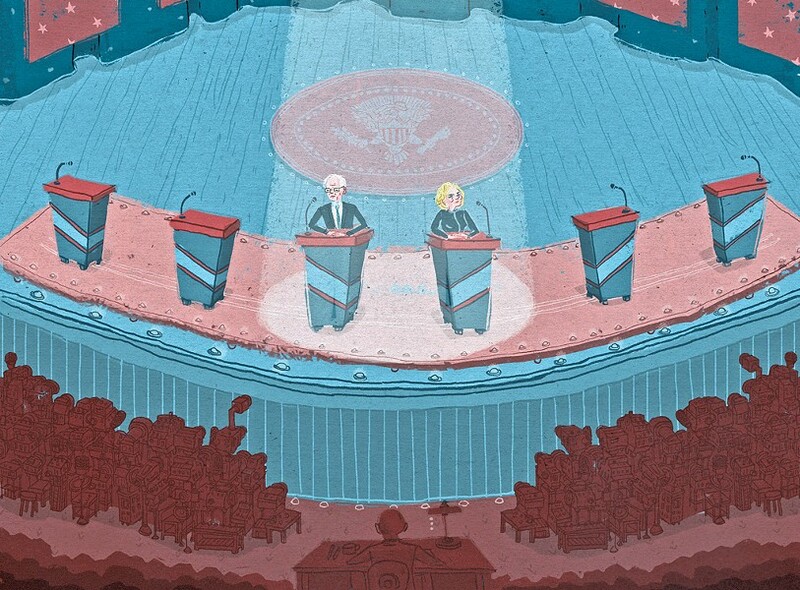 He's debated candidates who are richer and poorer, farther left and right, better and lesser known. Generally speaking, though, his Vermont campaigns have been mild, polite affairs. Sanders has never been in a debate with so many people watching, or against candidates with so much campaign experience. If he's nervous on October 13, he would hardly be the first presidential candidate with the jitters. When former Vermont governor Howard Dean ran for president in 2004, he and his staff focused heavily on preparation for the first debate, said Bob Rogan, who was Dean's deputy campaign manager. "The stakes were so high," Rogan said. "We were all nervous." Dean's staff and consultants compiled notebooks detailing the records of his multiple opponents, Rogan said. They gathered in a Burlington law office conference room for a mock debate, where Dean faced off against people acting as the other candidates. Congressman Peter Welch (D-Vt.), who was then president pro tem of the state Senate, played then-senator Joe Lieberman. In the end, though, the debate didn't go well for Dean, who would later rate his performance as a D-minus. "I think we over-prepared, and Howard got really stressed out," recalled Kate O'Connor, who also worked on Dean's campaign. "We told him, 'You've got to say this, you've got to say that.' He was really bad." She added: "You've got to remember to be yourself. You can't just have these scripted answers." But it is important to practice the little things, such as where to walk, and to know where the cameras, lights and water will be, according to Rogan. To get ready for a later debate, Dean's crew staged another one in Burlington City Hall Auditorium. The most important thing, Rogan said, is for a candidate to focus on the three points he or she wants the public to hear. Preparation is key to making sure that whatever questions are asked, the candidate smoothly shifts back to those main points. "You want to practice the pivot," Rogan said. Sanders, who has been delivering the same political message for 40 years, should have no trouble with that maneuver. But he should also expect to be grilled more intensely than he has to date, said Ben LaBolt, a former White House aide who has helped candidates, including Chicago Mayor Rahm Emanuel, prepare for high-level debates. "It will certainly be different than a rally with his stump speech," LaBolt said. "He's not had a 90-minute, prime-time national audience. The scrutiny level will be much higher." LaBolt said Sanders will likely be asked how he would pay for his proposals, such as universal health coverage, and how he would increase taxes on the wealthy. And there's the fact that "Hillary Clinton is a very accomplished debater," Devine conceded. "I expect she'll do well." The fact that Clinton is female could also present challenges for her male opponents. Just ask Rick Lazio, the former congressman who ran against her in 2000 for the U.S. Senate in New York. During a televised debate, Lazio pulled a piece of paper from his pocket, walked over to Clinton and insisted she sign a pledge against "soft" campaign money. "I want your signature," Lazio said, wagging his finger at her. Clinton shook his hand, effectively brushing him off, and went back to debating. Lazio's performance was widely characterized as bullying and made the Washington Post's 2011 list of "worst debate moments ever." What can Clinton expect from Sanders? John MacGovern was one of the last Vermonters to debate him, when he ran against the sitting senator in 2012. The Republican from Windsor said they debated four times before the election. Sanders beat him with 71 percent of the vote. "He's aggressive and will talk over you," MacGovern said. "You can't just be a gentleman the whole time, or he'll walk all over you." Sanders debated MacGovern one-on-one, but Sanders also participated in a traditional Vermont Public Television debate with all of the candidates, most of whom made Sanders look mainstream. Liberty Union Party candidate Peter Diamondstone accused Sanders of lacking the "cojones" to vote against a resolution in support of Iraq War troops. Sanders, unflustered, pointed out that he voted against the war. Sanders had faced a tougher candidate in the 2006 race against Republican Rich Tarrant. The two competed in a heated, high-spending campaign for an open Senate seat. Tarrant, a businessman who founded the health-care technology company IDX Systems, accused Sanders during one debate of having outlandish ideas about universal health coverage. Sanders shot back: "I hope your plan is better than the work you did on Fletcher Allen," a reference to Tarrant's time on the hospital board while it was mired in a parking garage financing scandal. But Tarrant and his supporters also managed to get under Sanders' skin. In a debate at the Burlington Veterans of Foreign Wars Post 782, Sanders said, "In some countries Osama bin Laden, if you can believe it, is more respected than George W. Bush." Tarrant's retort: "Mr. Sanders, I can understand your buddy Chávez saying something like that," he said of the Venezuelan president at the time. "You need to apologize." "No, I don't need to apologize," Sanders said. "You go to Egypt, you go to any of those Mideast countries..."
Tarrant's supporters started booing from the audience, and Sanders took the bait. "You don't believe it?" he said, his voice rising. "That's the truth. That is how sad the situation is." Last week, during the nationally televised Republican presidential debate, Sanders chimed in on Twitter — the next best thing to being there. "The American people overwhelmingly want to raise the minimum wage to a living wage. Too bad, the Republicans don't," Sanders tweeted. In another: "Trump, 'I will take care of women.' Really? What about respecting the right of women to control their own bodies?" Rader watched that debate. Could he picture Sanders holding his own? "If he'd been on that stage, he would have no problem going toe to toe," Rader predicted. Rader, who served as Burlington city clerk from 1982 to 1993, has been observing his former boss for a long time. "When the interviewer is hostile and has an agenda of his own, Bernie doesn't have a lot of patience," Rader said. "I think relaxing, being in touch with his sense of humor, which he definitely has, is and will be good for him." The original print version of this article was headlined "Fightin' Words: Sanders Readies for the Big Debate"